TAMPA, Fla.--Newt Gingrich swooped into an airport hanger at Tampa Jet Center on his chartered plane to meet a rowdy little assembly for the candidate and his surrogates Michael Reagan and Herman Cain. The campaign's advance team hung blue curtains so the cavernous space didn't appear to swallow the supporters. What the crowd lacked in numbers, it made up in sheer enthusiasm. Around the podium stood 30 peppy fans, including two elderly ladies in the front row, one with a "Newt 2012" sticker on her forehead and the other sporting an elephant hat with an American flag sticking out the trunk. A man standing near the back holding a "Don't Believe the Liberal Media!" sign kept yelling "Neutron Bomb! Neutron Bomb!" while another man standing to the side of the podium repeated "999!" Cain took the stage before Gingrich to warm up the crowd. Even though the former candidate is now stumping for Gingrich, Hermain Cain can't resist talking about Herman Cain. He touted the "999 plan" that was the centerpiece of his campaign and defended his decision to wait until the 11th hour to back Gingrich. Cain said he didn't endorse earlier "because I didn't want to." Then Gingrich took the stage. 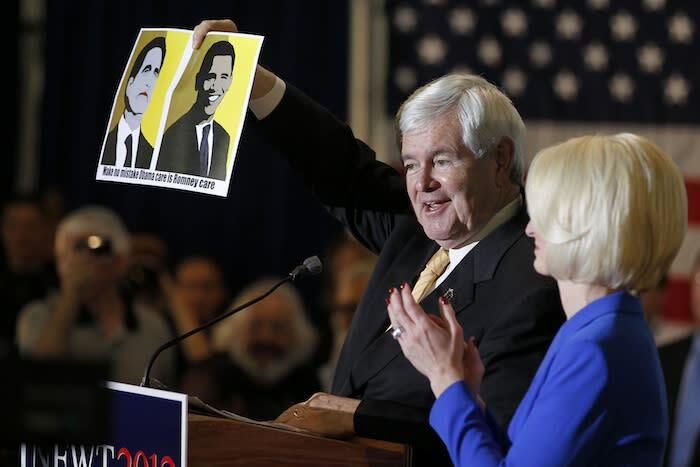 In the final afternoon before polls open here, Gingrich kept his message to hot-button religious issues and similarities between President Barack Obama and Mitt Romney. He assailed the decision by the Obama administration to force church-affiliated organizations to cover birth control in employee health care plans, calling it "a fundamental assault on the right of the freedom of religion." "I think we need to have a government that respects our religions," Gingrich said, appearing visibly agitated. "I'm a little bit tired of being lectured on respecting every other religion on the planet. I want them to respect our religion." While vague, but Gingrich vowed to sign an executive order on day one of his presidency "repealing every Obama attack on religion across the entire government." Then he transitioned to attacks on Romney, who in 2003 as governor of Massachusetts rejected a state program that would provide kosher meals to elderly Jews in nursing homes, a move that saved the state $600,000. The story was reported in the New York Post earlier this week. "Governor Romney cut off kosher meals for Jewish senior citizens who were on Medicaid to save five dollars a day," Gingrich said. "He said, 'No, you can't follow your religious prescription.'" Title: Ty Cobb, Fmr. Trump lawyer, explains his thoughts on Trump’s lawyer's actions when protecting him.